Handcrafted products like ceramics, embrodery, lace mantillas and fans, food stuff, fashion clothing, jewellery, gifts and antiques are some of the objects exhibited in shop windows. In the andalusian capital, traditional establishments coexist with the new tax exemptions, commercial centers and design shops, and offer the visitors a wide range of possibilities for their shopping. From hand made articles and souvenirs to sophisticated clothing, can be bought in stores, work-shops, comercial centers and local street markets. 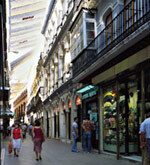 The main areas for shopping are the Casco Antiguo, Triana and Nervión. In the Casco Antiguo, the historical center, always full of life, is the most outstanding comercial area in seville, and it is packed with all kinds of shops. In Plaza Nueva, the pedestrian streets of Sierpes and Tetuán and the nearby ones we find the great “franchises” and fashion shops where we can buy typical souvenirs, craft and leather work, guitars, flamenco suits, fans, embroidering, etc. Also in the Casco Antiguo, the Feria Streetin the mythical district of Macarena is one of the best places to purchase furniture. .
On the other side of the Guadalquivir river, in the narrow streets of the district of Triana, we run into a great number of stores specialized in ceramics. Mainly in Alfarería street, Antillanos Campos and San Jorge Streets, we can buy clay plates, glasses, jugs, mirrors, clocks and excusivepieces all made of clay. In order to find the last tendencies in clothing at reasonable prices, the best thing is to approach the avenues of Luis de Morales, Eduardo dato and Luis Montoto Street, in the district of Nervión, next to Santa Justa Station. In this area we have big departments stores and some of the most important fashion shops. The most traditional and lively street market in Seville is called “el Jueves”, taking place every thursday morning in Feria Street. The stalls are full of books, second hand clothes, quaint objects, tools, pictures, antiques and furniture. On sunday mornings, stamp collectors and numismatist meet in Plaza del Cabildo until 15:00h. And the same day, but in Plaza de la Alfalfa, meet all the ones interested in animals, specially birds. Schedules: some stores, especially the great tax exemptions, and the commercial centers usually open from 10:00 to 21:00h. The traditional commerce has an approximated schedule of 10:00 to 13:30h and from 17:00 to 20:30h. Sales: generally, they begin the second week of january, until the end of february in winter, and from the first of july until the end of august in the summer season. How to pay: cash or card, always showing the passport or identity card. Tax Free: residents of outside the European Union, with purchases for more than 90’15€, have the right of reimbursement of VAT. Seville Card: thanks to this card, that can buy in the Tourism Offices, you will be able to obtain discounts in shops, restaurants, spectacles, leisure centersand interesting advantages, as free access to the most of the museums, limitless use of public transport or a guided visit to Santa Cruz district.